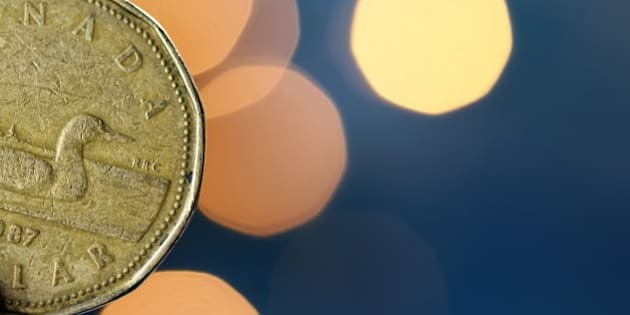 The Canadian dollar hit a five-year low around 88 cents U.S. Monday night, and fell further Tuesday morning as oil prices faltered and currency investors reacted to very dovish comments from Bank of Canada governor Stephen Poloz. Oil prices hit a four-year low on Tuesday, on news that Saudi Arabia is cutting prices for its U.S. clients. It strengthened speculation that Saudi Arabia is trying to regain market share from U.S. shale operations, and the oilsands, by lowering prices to below the cost of production in North America. Brent crude hit $82.63 on Tuesday, the lowest price since October, 2010. “I think what we have is really everything working against the Canadian dollar here,” Scotiabank currency strategist Camilla Sutton said, as quoted at the Globe and Mail. “These developments include a disappointing GDP release last Friday, coupled with the collapse in oil prices and a dovish Governor Poloz, all of which have taken place in an environment of broad [U.S. dollar] strength,” she said. TORONTO - The Toronto stock market looked set for a lower open with energy shares likely under further pressure as oil prices hit three year lows after Saudi Arabia cut prices to its U.S. customers. A sharp fall in oil prices and dovish comments Monday by Bank of Canada governor Stephen Poloz pushed the Canadian dollar down 0.3 of a cent to 87.75 cents US on top of a slide of 2/3 of a cent. U.S. futures were lower as the Dow Jones industrial futures lost 20 points to 17,265, the S&P 500 slipped 2.7 points while the Nasdaq slipped 8.5 points to 4,148.8. The December crude contract in New York fell $2.41 to US$76.37 a barrel after Saudi Arabia made the price cut. BMO Capital Markets senior economist Robert Kavcic said the move added "to speculation that Middle East producers are working to defend market share amid surging U.S. output." Prices have also been pushed downward by U.S. dollar that has gained in strength lately as the U.S. Federal Reserve's quantitative easing program concluded at the end of October. Crude prices could come under further pressure during the session as the American Petroleum Institute will publish initial data that will likely show a further increase in U.S. oil supplies. Other commodity prices also declined Tuesday morning with December copper down five cents to US$3.02 a pound while December gold was down $2.50 to US$1,167.30 an ounce. Investors also took in data showing the eurozone economy in precarious shape. The European Commission has cut its growth forecast, saying growth will come in at 0.8 per cent this year, down from 1.2 per cent growth it forecast this spring. In other corporate news, TransCanada Corp. (TSX:TRP) is planning to expand its Nova natural gas pipeline system by 2017 at a cost of $2.7 billion. The system currently carries about three-quarters of the gas produced in the Western Canada Sedimentary Basin, which has been a major source of Alberta's conventional gas supply, but TransCanada says demand from shippers has increased.